Questions about becoming a NeurOPTIMAL® Neurofeedback trainer? Contact me. If you are considering integrating neurofeedback into your business, please contact me. I am passionate about this particular method of neurofeedback because it makes the most sense of any other approach out there. And the genius is in Dr. Val Brown’s software. Since he has owned, operated, been certified and taught almost every neurofeedback system out there, he understands how they all do what they do. Within a very short time, you will be up and running. And I can help you shorten your learning time dramatically You begin to see very quickly that your clients can feel better quickly because their brain is capable to amazing change if you can provide it with complete information about what is is doing. Since it is an energy conserving system, the brain always wants to spend the least amount of energy to accomplish life. This neurofeedback approach mirrors back to the brain what it is doing and the brain naturally responds by renormalizing itself. In the past few years, I have had relationships with Psychotherapists and somatic therapists who ultimately decided to become Zengar NeurOPTIMAL® neurofeedback trainers. It has been a pleasure to introduce and support them in their process of discovering the powerful benefits of offering brain training to their clients. One of those individual’s was a psychotherapist, another a Psychologist, another came from another field not related to therapy, one was a Rolfer®, and a couple were business coaches. This is what is wonderful about NeurOPTIMAL®; it can be used by anyone since it is not a therapy, but a training approach. Certified trainers work in many fields of endeavor; professional coaches, athletic trainers, body therapists, psychotherapists and psychologists, performing arts trainers, business coaches, executive trainers and on and on. It’s training! With NeurOPTIMAL® neurofeedback training, we neither diagnose nor is it therapy. We are training the Central Nervous System to do what it does best, which is improving how resilient it is in the face of stress of daily life; this can translate into many benefits. When a individual’s nervous system begins to shift to a more efficient use of its own energy, all sorts of benefits arise. Download my brochure for a partial list. And see what this psychotherapist says about what NeurOPTIMAL has done for her practice. I took me a long time to observe what was happening in the field of neurofeedback; I am happy to share this knowledge with you to streamline your process. 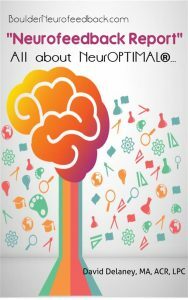 Nothing attracted me like the NeurOPTIMAL® brain training approach. The simple fact that Val and Sue Brown, the developers of NeurOPTIMAL®, have owned, operated, and been certified (and taught) most of the major neurofeedback approaches being used today helped me better understand the difference in the technology. In fact, NeurOPTIMAL® can do what all those other systems can do; and much more. This statement is based in my experience of having owned and operated it now in my ninth year. I also offer Supervision to individuals who wish to become a NeurOPTIMAL® Trainers. I will teach you everything you need to know in order to integrate this technology into your practice in a streamlined way; you don’t have to make all the mistakes that many of us made in that process. I also offer marketing and business consultation so that you can get up and running in a short amount of time. Please let me know if I can be of service to you. Becoming a NeurOPTIMAL trainer: there is wonderful support in developing your practice should you decide to go this route. On top the the supervision and business consultation which I offer, there are power point presentations, webinars, online certification classes (so you don’t have to travel), a moderated members forum (I moderate the Big Picture Forum and Personal User’s Forum for Zengar Institute) with direct contact with other trainers around the world across many topics from the technical aspects to clinical concerns to working with children to peak performance sleep forum, and much more. The other thing I love about NeurOPTIMAL® is that it is not ‘expert’ driven so anyone can learn to work with clients right away. And with a PASS membership, you have access to tech support from the comfort of your office or home. Updating or maintaining your system is easy, all done online. And with the private Facebook support groups, whatever you need in the way of support is at your fingertips, literally. I am happy to share more when we speak. financing plan available to those who qualify. *I do benefit financially if you purchase a system as I am an Affiliate Representative for Zengar Institute; this has not always been the case. Other individuals purchased professional systems and I gave them time because committed to helping more folks will receive help in reducing suffering and improving happiness and joy in their lives. I know first-hand how an individual can be deeply suffering in their life without having received relief based on 30 years of work as a therapist. So I am very happy to have you visit my office or speak to you by phone or Skype; I will show youthe NeurOPTIMAL system (Skype or Facetime work well if you are out of my area), help you better understand what we do to support clients.